Castle Vardulon: M. Night Shyamalan: Plagiarist? Here’s an R-rated clip from the movie ‘The Happening’. Now, let’s take a look at the front page of Fawcett’s ‘Marvel Family #38’, published in August, 1949. “But Count”, you may ask, and thanks for using my title, BTW, “how can we know that M. Night ever read that comic?” That’s actually a good point – obviously, I can’t guarantee that’s the case, but the idea of him ripping off a Captain Marvel story isn’t as far-fetched as it initially seems. 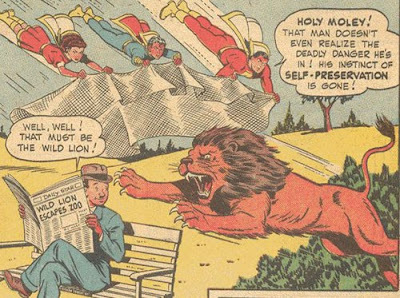 So let’s take a look at the Marvel Family story ‘The Extinct Instincts’ and see how a Golden Age comic covered the same material as Shy’s gorefest. Oh, look, there’s the lion again. Not only is that an extremely familiar image, but now we’ve got Cap flat-out exclaiming the premise of ‘The Happening’ as well. First he takes away a rabbit’s fear of a hound, then the hound’s desire to kill the rabbit, and finally a homing pigeon’s sense of direction. Although I’d heard that actually came from their magnetic beaks, but maybe he’s taking away their instinct to follow those directions. Sivana quickly moves on to bigger game, removing an entire city’s instinct to eat, and just days later people are collapsing from hunger. 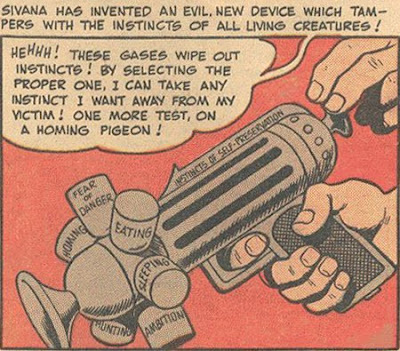 This naturally attracts the attention of the Marvel Family, who fly out there in time to watch Sivana test out another instinct inhibitor. At this point I’d like to point out that Sivana doesn’t really have a plan or make any demands in this story. Normally he’s got some kind of a scheme to take over the world, but this time around he’s just trying to kill as many people as he possibly can, simply because he’s invented a scientific device that allows him to do so. There’s a message in there somewhere about the uncontrolled pursuit of progress, if only I could find it! 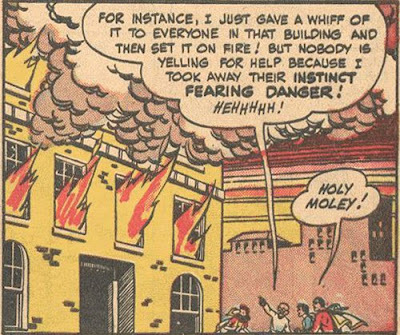 Anyhoo, it’s time for the Marvel Family to save the day – after rescuing a few people from the burning building and cleaning up the mess left by Sivana’s relieving people of their instinct to be productive at their jobs (wait, that’s an instinct now? ), they get a hold of the gun and use their knowledge of science to generate an antidote that reverses the effects on the entire town. Which, of course, is just what he does, building an entirely new gun that he takes to the radio station and uses to gas all three of the kids. So what does he do then? 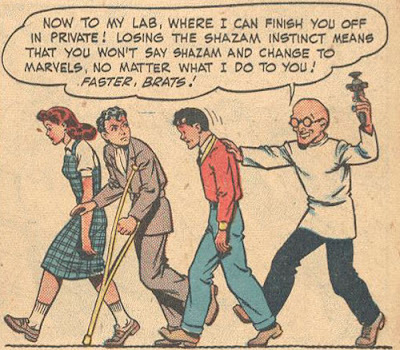 Yes, he’s taken away their instinct to say Shazam! which, again, is not an instinct. 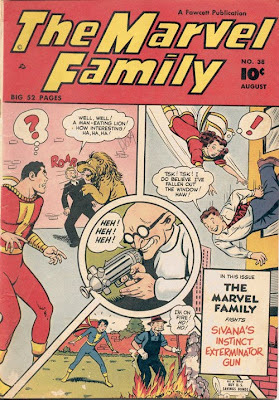 Sivana has forgotten something key, though – Captain Marvel Junior doesn’t say “Shazam” to transform, he says “Captain Marvel”! This allows Freddy to transform into Cap jr. and save the day! Sivana is jailed, and we get our default happy ending! 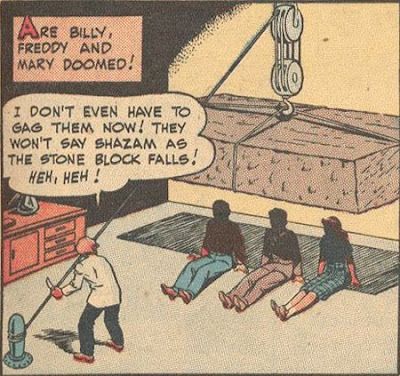 Although, come to think of it, if Sivana, instead of creating a fancy new Shazam-instinct gas, had just used the self-preservation gas on them, they wouldn’t have been worried enough about the falling concrete block to bother transforming. Also, if Freddy could have transformed at any point, why did he wait until the last possible second? Oh, wait, I’m not here to criticize a Golden Age comic, I’m supposed to be looking at its similarities to The Happening. Right. So let’s do that. While obviously the Shy film doesn’t follow the outline of this story very closely (or at all, actually), the central premise, an instinct-negating gas, is exactly the same. A wag might also comment that the film’s dialogue was written in the style of a Golden Age Comic since, like those funnybooks, every single sentence in the movie had an exclamation point at the end of it. And since I consider myself a wag, I do say that. If anything, the comic treats its main device more realistically than The Happening does. The film tries to explain that the trees aren’t putting out ‘suicide gas’, but rather negating people’s instinct towards self preservation. But it’s not actually doing that – unless everyone wants to kill themselves at all times in visually compelling ways, and the only thing keeping them from doing so is their instinctual desire to continue living. I’ll admit that when I’m up on a high balcony, there’s a part of me that wonders what it would feel like to fall through the air – but I don’t do it because I understand it would result in my death. So I can believe that someone with their instinct towards self-preservation removed might well wind up tossing themselves off a roof that they happened to be on. But when I hold a knitting needle in my hand, there’s no part of me that wants to plunge it into my own neck. When I see a riding lawn mower sitting idle, there's no part of me that wants to rig it so that it can run in a straight line without anyone driving it, then run ahead it and lie down in its path. Which is why Captain Marvel’s treatment of the exact same subject matter managed to be far more realistic and entertaining than ‘the Happening’. It just hit me how sad that is. Going to all the trouble of making a two hour, mid-eight-figures movie, and then it winds up being worse than the 60-year-old 10-page children’s comic book story you were ripping off. Now I feel bad about Shyamalan again. What’s that? He got paid millions of dollars for that terrible rip-off, and it cemented his once-shaky position as a bankable filmmaker, leading to him getting the Avatar: The Last Airbender gig?